The Peggy Guggenheim Museum houses a wonderful modern art collection in a pristine palazzo on the South Bank of the Grand Canal in Venice. When you walk onto the estate you quickly sense that this was once a magnificent home. You can stroll in the garden, sit in the sun on a carved stone bench, pass by African and Primitive art in the study, a Pablo Picasso in the living room, a Joan Miro in the bed-room, and then visit Peggy Guggenheim's tombstone. Yep, she's buried in the garden, next to her beloved Llasa Apso dogs. A free-spirited bohemian socialite, Guggenheim enjoyed mingling with writers and artists in pre-war Europe. She also slept with a substantial number of them, but was not a lightweight fangirl. She had a keen eye for up-and-coming artists, and played an important role in promoting the work of some huge super stars of the art world, including Jackson Pollock. She started out dealing art over the strenuous objections of her famous uncle Solomon, but eventually switched to collecting. With her good friend and mentor Marcel Duchamp, she bought one picture a day for seven years, to create the collection. It includes 10 Picassos and 40 Max Ernsts, and loads of work by Rene Magritte, Man Ray, Salvador Dali, Paul Klee, Marc Chagall...just to name a few. Guggenheim donated her home and her collection to the Solomon R. Guggenheim Foundation, so the museum is now part of the global Guggenheim chain of museums which include the Solomon R Guggenheim Museum in NYC, the Guggenheim Bilbao, the Guggenheim Abu Dhabi and the Guggenheim Las Vegas. Peggy Guggenheim's great love in life, some suggest, was not her lovers or friends, nor her children or eight grandchildren, but her dogs and her art collection. And that's something we can get behind. 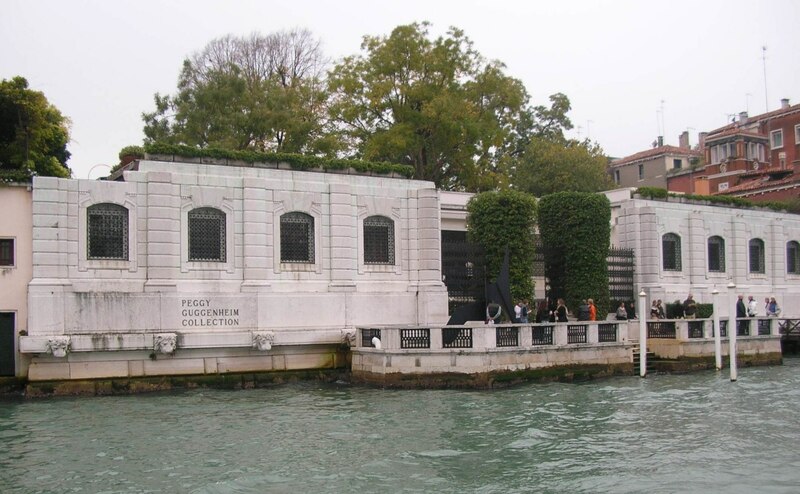 The Peggy Guggenheim Collection is a modern art museum on the Grand Canal in the Dorsoduro sestiere of Venice, Italy. It is one of the most visited attractions in Venice. The collection is housed in the Palazzo Venier dei Leoni, an 18th-century palace, which was the home of the American heiress Peggy Guggenheim for three decades. She began displaying her private collection of modern artworks to the public seasonally in 1951. After her death in 1979, it passed to the Solomon R. Guggenheim Foundation, which opened the collection year-round from 1980. The collection includes works of prominent Italian futurists and American modernists working in such genres as Cubism, Surrealism and abstract expressionism. It also includes sculptural works. In 2017, Karole Vail, a granddaughter of Peggy Guggenheim, was appointed Director of the collection, succeeding Philip Rylands, who led the museum for 37 years. Check out the full Wikipedia article about Peggy Guggenheim Collection.